Blank-fed, narrow roll-fed, and wide roll-fed paperboard forming machine lines. Roll-to-roll paperboard moistening machinery. Molded pulp afterpress machinery. Various shaft type and shaftless roll stands. Forming die sets. Cutting die sets. Cut/score die sets. Complete ancillary mounting equipment. Several hundred product designs have been successfully produced. Rounds, ovals, squares, rectangles, triangles, hearts, multi-compartments, etc. New tooling also supplied for competitive machinery models. Complete mechanical, electrical, pneumatic, and hydraulic component support for all Peerless produced machinery and tooling. Numerous kits or packages available for existing machine lines. Variable speed main drives. Servo motor feed drives. Decurl units. Cutting die set installation and removal packages. Jam detection systems. Automatic lubrication systems. Grease panel and contaminate control kits. Air cylinder draw ring kits. Photoelectric registration control systems. Secondary scoring units. Cam housing support gusset kits. Interlock guarding systems. Etc. Re-machining forming surfaces. Re-fluting forming surfaces. Re-clearance for paperboard caliper changes. Blank stop repairs. Plunger rebuilding and replacement. Heater replacement. Etc. Routine maintenance including grinding punches and peening die plates. Liner pin and bushing replacement. Cut-off knives and insert replacement. Replacement steel rule. Etc. Customer service is available via telephone, fax, email, or personal visit. Trained personnel are available to assist any and all customer service needs. If service personnel are requested, a service rate sheet is available. Various plate, tray, and bowl stock forming die sets are available for customer sample production. Sample making is also available for specific customer tooling. Lab testing for various paperboards and composite sheets to determine forming characteristics. Traditional and 3-D product drawings of paperboard plates and trays can be generated for customer review, presentations, and feasibility studies, etc. 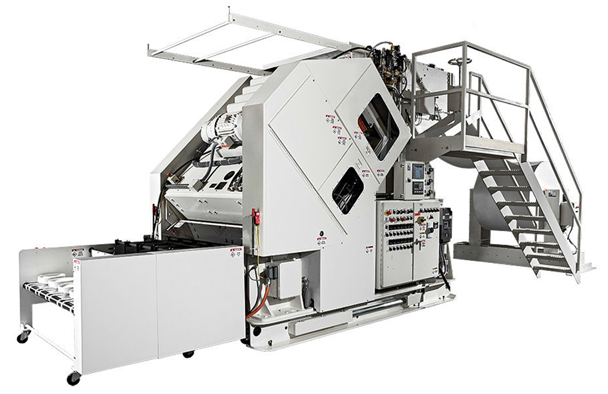 Production machine cutting die or cut/score die set printing layout available to assist customer printing efforts. Precise product blank and scoring layouts can be generated for customer review and utilization in printing layout, etc. Peerless’ engineering and design staff is available to assist customers with new product development and production feasibility studies. Peerless has over 90 years of experience and historical perspective to draw from in assisting customers.